South Korean stocks hit a five-year high on Monday, driving Asian shares excluding Japan to a seven-year peak, after Monaco-based Sovereign Asset Management fund invested $975 million in Korean conglomerate LG Corp and its phone and appliance unit, LG Electronics Inc.
Sovereign, the second-biggest shareholder in top South Korean oil refiner SK Corp. said it had no intention of trying to change the management at LG Group, the nation's number two conglomerate, but some analysts were not convinced. Sovereign Asset Management may seek to indirectly participate in the management of two LG companies in which it bought stakes of over 5 percent last week, market watchers cautiously observed. But Sovereign backs the current management of the two LG companies and has no plans to field director candidates or rewrite their corporate bylaws. The benchmark Korea Composite Stock Price Index (KOSPI) ended 4.61 points, or 0.46 percent, higher at 988.71, extending its gaining run to a sixth session. It was KOSPI's highest close since Jan. 4, 2000, when the index finished at 1,059.04. Volume on the main Korea Exchange was heavy at 619 million shares worth 4.34 trillion won (US$4.23 billion). Gainers led losers 530 to 240. Sovereign said it bought 5.7 percent of LG Electronics and 5.46 percent of LG Corp., touting the LG Group companies' good corporate governance. LG Group affiliates soared on the news. LG Corp., the holding company of LG Group, gained 14.88 percent to 28,950 won, and LG Electronics Inc. ended up 7.07 percent at 80,300 won. Market leader Samsung Electronics, the world's second-largest semiconductor maker, advanced 0.19 percent to 528,000 won, and Hynix Semiconductor ended up 3.51 percent to 16,200 won. 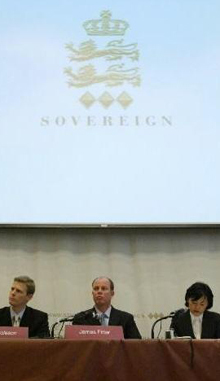 "We will treat Sovereign in the same way as other investors," the LG Group said in a statement. "The principle of fair treatment sticks regardless of shareholders' stakes." The conglomerate said it will double efforts to further improve its governance standards. 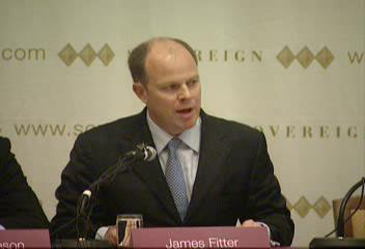 "We will stick to market principles more faithfully and try to maximize shareholder value." 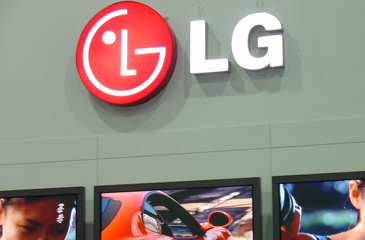 LG said LG Corp.'s chief financial officer met with Sovereign Chief Executive James Fitter last Saturday to receive a briefing on the fund's stake purchase. The stake purchase in the two LG Group affiliates has raised the value of Sovereign's total investment in South Korea to $2 billion. Sovereign said the purpose of its investment in the South Korean market is to "congratulate South Korean companies on their successes." It added that investor distrust in managerial transparency is the prime reason for the "Korean discount," or the under valuation of South Korean stocks despite their high intrinsic value.